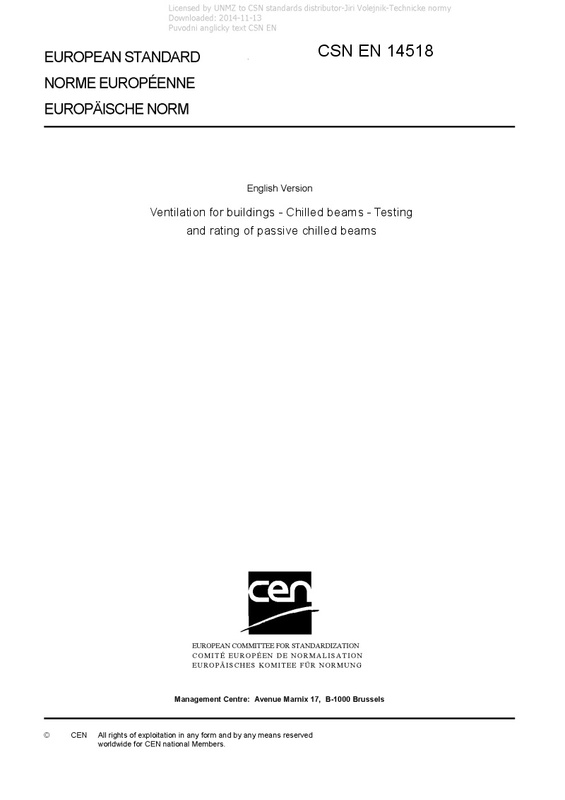 EN 14518 Ventilation for buildings - Chilled beams - Testing and rating of passive chilled beams - This European Standard specifies test conditions and methods for the determination of the cooling capacity of chilled beams or other similar systems with free convection, i.e. without forced air flow. Also included is the method to determine local air velocity and temperature below the beam. The purpose of the standard is to give comparable and repeatable product data. The test method applies to all types of convector cooling systems using any medium as energy transport medium. NOTE The result is valid only for the specified test set up. For other conditions, (i.e. different positions of heat loads, inactive ceiling elements around the test objects or forced flow into or around the test object), the producer should give guidance based on full scale tests. This standard refers to water as the cooling medium throughout, however, wherever water is written, any other cooling medium can also be used in the test. Where air is the transport medium this air may not be discharged into the test room.